This is a New Testament window representing the spread of the Gospel. Saint Paul is seen preaching on Mars Hill. 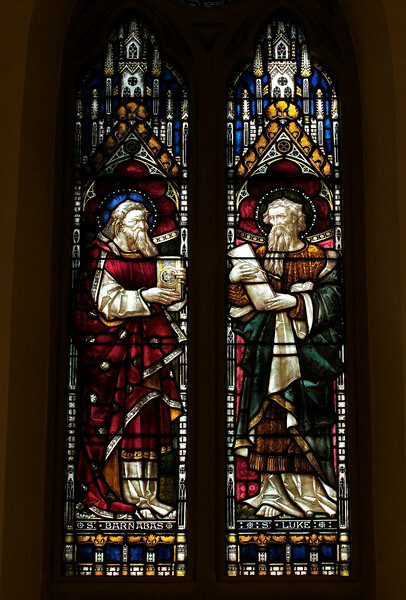 Shown above him are Saint Luke and Saint Barnabas, Paul’s companions. Clayton and Bell was one of the most prolific and proficient workshops of English stained glass during the latter half of the 19th century, according to Wikipedia. The partners were John Richard Clayton (London, 1827–1913) and Alfred Bell (Silton, Dorset, 1832–95). The company was founded in 1855 and continued until 1993. Their windows are found throughout the U.K., U.S., Canada, Australia and New Zealand. During the Medieval period, from the Norman Conquest of England in 1066 until the 1530s, much stained glass was produced and installed in churches, monasteries and cathedrals. Two historic events had brought an end to this and the destruction of most of the glass-the Dissolution of the Monasteries under Henry VIII and the Puritan era under Oliver Cromwell in the 17th century. The early 19th century was marked by a renewal of the Christian faith, a growth of Roman Catholicism, a planting of new churches, particularly in centers of industrial growth and the restoration of many ancient churches and cathedrals. In the 1850s a number of young designers worked in conjunction with the leading Gothic Revival architects in the provision of stained glass for new churches and for the restoration of old; the work of John Richard Clayton, Alfred Bell, Clement Heaton, James Butler, Robert Bayne, can be found in Incarnation. Initially Clayton and Bell’s designs were manufactured by Heaton and Butler, with whom they shared a studio between 1859 and 1862, employing the very talented Robert Bayne as a designer as well. From 1861 Clayton and Bell commenced manufacturing their own glass. Robert Bayne became part of the partnership with Heaton and Butler, forming the firm Heaton, Butler and Bayne. There was a good deal of interaction and influence between Clayton and Bell, and Heaton, Butler and Bayne. The windows of both firms share several distinguishing features and characteristic color-combinations, which are uncommon in other designers. Clayton and Bell moved into large premises in Regent Street, London, where they employed about 300 people. In the late 1860s and 1870s the firm was at its busiest, and employees worked night shifts in order to fulfill commissions. Clayton and Bell was awarded a Royal Warrant (Royal warrants of appointment have been issued for centuries to tradespeople who supply goods or services to a royal court or certain royal personages. The royal warrant enables the supplier to advertise the fact that they supply to the issuer of the royal warrant, so lending prestige to the supplier) by the Queen in 1883. According to commentary in Wikipedia, Clayton and Bell windows are typified by their brilliant luminosity. In 1863 John Richard Clayton was among those who was experimenting with the manufacture of so-called pot metal or colored glass produced by simple ancient manufacturing techniques which brought about great variability in the texture and color of glass which is characteristic of ancient windows.